And for the fashionistas among us, Fiat is offering a new option: your very own Gucci-designed Fiat Cinque Cento. Yes folks, you can actually drive a Gucci-designed Italian bug around town. Wow. I love my paid-for, beautiful 2002 BMW 325i — which is, actually, the ultimate driving machine. (They’re not kidding.) But I might smell a new car interior, and the new car payment to go with it, in my not-too-distant future. Anyway… here’s wishing you buonasera and buon Domenico domani. 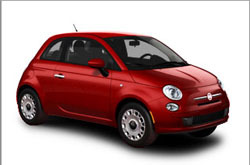 Hey Celeste, we’ve had these little Fiats in Canada for about 6 months already…they are sooo cute!! I just came back from the Med and they were everywhere! I’d sure love to have one. I can see you zipping around town in your own Gucci-Fiat!! Post pictures when you get it! !